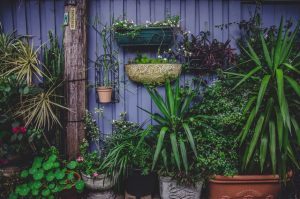 Container gardening is a great way to have a low maintenance garden that you can fit on your porch, your deck, or even your apartment balcony. Not all people have room around their yards for gardens, and not all people have yards in the first place. However, if you have a green thumb and you’re itching to start growing anything from trees and flowers to fruits and vegetables, you can do these things with the ease of container gardening. Picking the right plants can mean many things. You want plants that will thrive in the space you have available for them, whether you’re keeping them on a tiny balcony or spreading them out on a large deck in your backyard. Space is definitely a factor, both above the dirt and below. If you’re growing something like carrots or potatoes, they need space below them to grow. Picking the right plants also depends on your climate. If you live somewhere that is extremely hot during the summer you may find that some plants dry out or get burned in that extreme sun. However, you may also find that ins some climates a colder summer weather pattern may not work for other plants. You can research which zones/regions are good for what plants, from foods to flowers, on any site that sells seeds and plants. You also want to choose plants that you enjoy and/or plants that serve a purpose in your life. Maybe you want to grow your own fruits and vegetables, so those are the types of plants you’ll choose. Maybe you want to have a herb garden. Or maybe you’re growing plants and flowers that can be used to make flower arrangements. Not only do you want to make sure that you’re picking the right plants, but you also want to make sure you’re planting your plants in the right size containers. You need to do a little research before you start dumping dirt and poking seeds into spaces. Consider how far apart the seeds need to be planted and how deep, first off. Crowded plants will have difficulty growing. If you plant something too deep it may never sprout, or not deep enough it may topple over. For optimal growing, always follow instructions on the seed packets. You also want to pick the right place to put your containers. Most plants need at least some sun in order to grow and flourish, Make sure you are keeping your containers in a spot that at least gets a few hours of sun every day. If the pots aren’t too large and heavy you can at least move them to a different spot if you find that your chosen area isn’t offering them enough sunlight.